What is the best epilator for women? A review of what I consider to be the best epilator for women - the Braun Silk-Epil Wet and Dry 7. Are you one of those women who loathes the thought of having to shave? If so, join the club! For years, I used to suffer from nicks, bumps and burns as a result of shaving in, dare I say it, a shower the size of a miniature broom closet. This is why I took to epilating my legs once a month. Epilation is a simple yet ingenious system that requires a) a small machine with dozens of tiny rotating tweezers, and b) a pinch of courage. In this article, you'll discover what I believe to be the best epilator for women on the market today - the Braun Silk-Epil Wet and Dry 7. 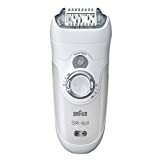 The best epilator for women who hate shaving! 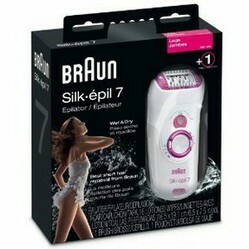 The Silk Epil Wet and Dry 7 is one of the newest epilation products available from Braun. Out of all the epilators I have tried so far, including those from Braun, I have found that this one is the most efficient, as it causes less pain and appears to pull out more hair thanks to its 40-odd tweezers. As for the pain, I'm not going to lie - it hurts, especially if your pain-threshold is as low as mine. If I were to make a comparison, I'd say it is much like having someone flick a number of small elastic bands at your skin simultaneously. This said, if you consider that you only have to use it once a month before you see any significant hair growth, you'll agree that the pain is worth the gain. Something I often do before epilating is to cool the area with an ice pack. Doing so tends to numb the skin. You can also choose the speed (soft or fast) at which the tweezers rotate. A lower rotation rate will generally result in less pain. ...for the beginners out there! Epilation can be scary for those who have never tried it. The first time I put that vicious-looking little machine to my ultra-sensitive legs, I felt as if I had unwittingly signed up for a torture session from which I couldn't escape. However, as with most scary things, it really wasn't as bad as I had imagined. Time, patience and experience turned epilation into a banal monthly routine. In fact, I hardly blink an eye these days! If you are new to epilation, here are a few tips I can give you to make the experience as stress-free as possible. 2. Massage your legs with cream a half an hour before epilating. Doing so will not only open your pores, but it will make your legs more supple. 3. Have a hot bath before epilating for the same reasons above. 4. Put a cold ice pack on the area seconds before epilating. It will help to numb the skin. 5. As you epilate, press firmly down onto the skin and move the machine slowly up your legs. If you move too quickly, the tweezers will simple snap the hairs in two rather than pull them out. 6. Take as much time as you need. If you find the pain is too much, do a small area and come back to it later. 7. If you experience red bumps after you finish, rub in some skin moisturizer. It will disappear within 24 hours. A helpful video showing you how to epilate correctly. Do you epilate your legs? Find this epilator on eBay! Deals are plentiful on eBay! Share your thoughts about the Silk-Epil 7! Have you wondered this, too? I am sick and tired of the men in my life telling me there's something wrong with me. I did some digging and found out I have nature to blame.